After the Banks Family Estate obtained a Super-Respctability Injunction against our fine publications, banning there publication on the Howdy Thread. 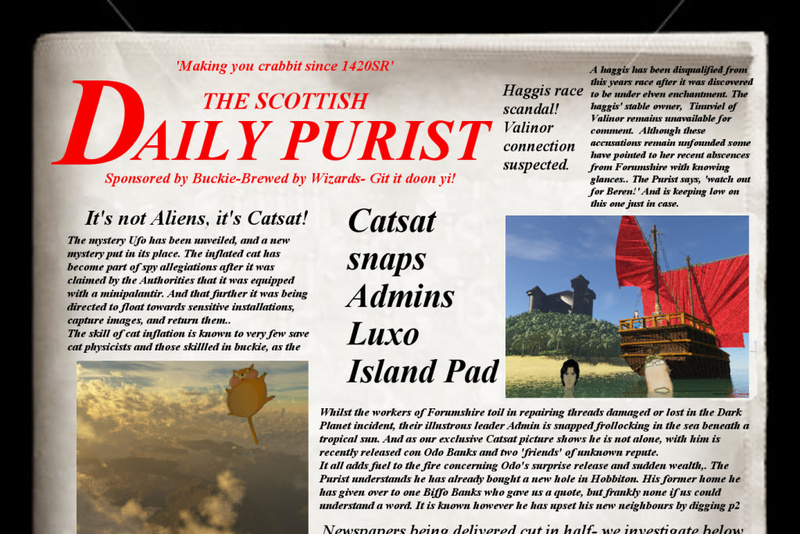 We at Pure Publications are happy to present two new threads dedicated to bringing you the best news and gossip (mainly gossip) from Forumshire. 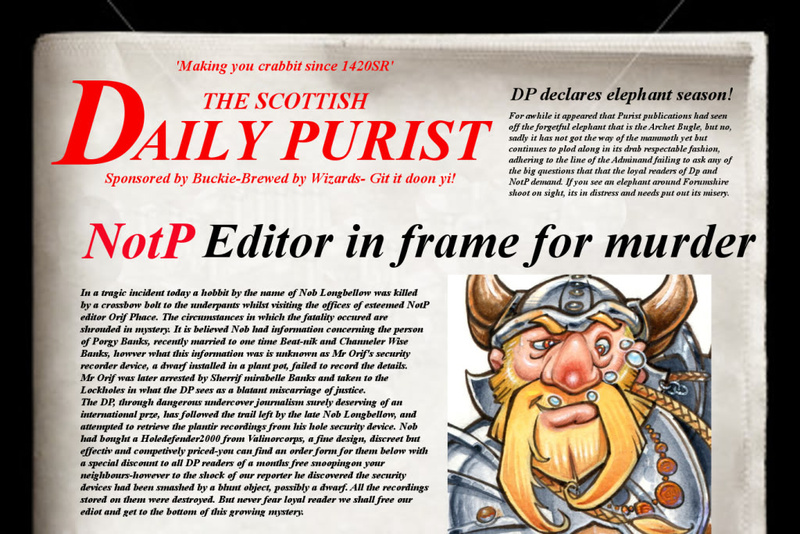 Beginning here with the Daily Purist. Previous editions have been gathered here and all new editions will appear on this thread. 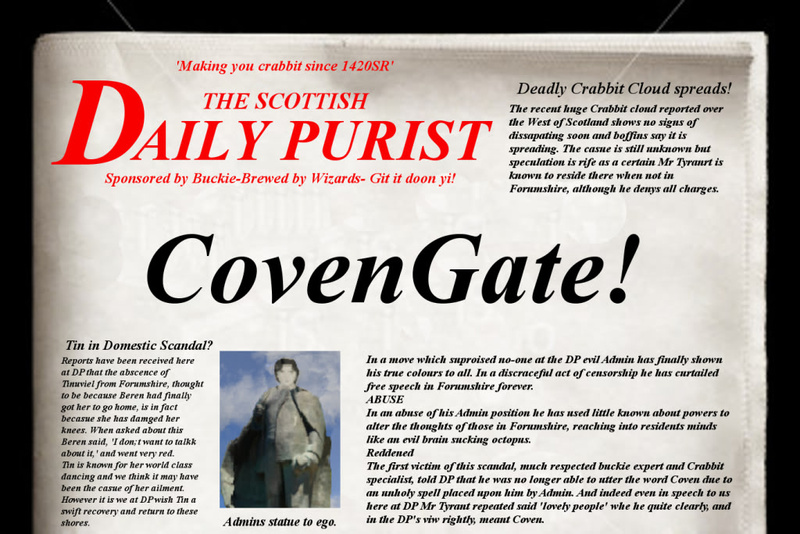 Visit our sister thread the News of The Pure- for more than just news! These sordid rags are like a hydra head - only twenty times uglier!!!! Those Bankses are like a soap opera - only twenty times the drama. I think it's Biffo Banks and that Squatch that Odo keeps on going on about. I don't know her/him? but i'm sure that no harm was intended! Whoever the vandals might be, and whatever their motives, at least they did a good job. When I'm a Sergeant I will take a zero tolerance approach to this kind of behavior! That's the trouble with the Shiriff's office at the moment, no spine at the top! "What you need to know, from the people who knew it first." 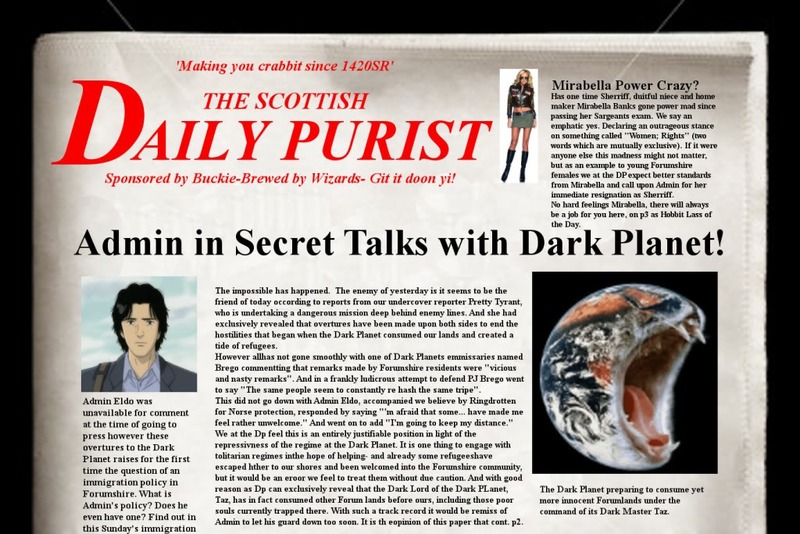 It is the great pride and pleasure of State News to announce that Admin Eldo is currently in talks with representatives of the Dark Planet to come to an accord between the two communities and to achieve "peace in our time". 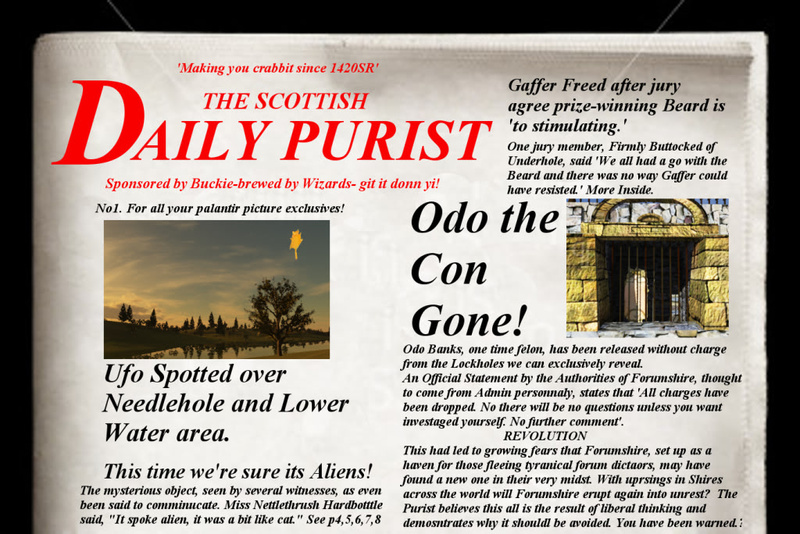 After the massive upheaval surrounding the consumption of the Old Forum by the Dark Planet and the subsequent founding of our current home in Forumshire by a flood of refugees, bravely led by Eldo, this represents a major turning point in Forumshire's history. Ongoing tension between the two sides has flared on and off over the past several months, including outbursts of crabbit and misunderstanding. Admin Eldo during negotiations with Dark Master Taz of the Dark Planet. The current detente was brought about by the efforts of brave individuals on both sides, including moderators and minions of the Dark Master as well as a scraggly array mostly drunk and confused Forumhobbits. In addition to the efforts of individuals in reaching out and embracing their fellows, Admin Eldo deserves praise for his bold, quick action in establishing lines of communication and constructive methods of peace-building. The entire Administration has toiled tirelessly to secure a new era of peace and prosperity for all of Forumshire. 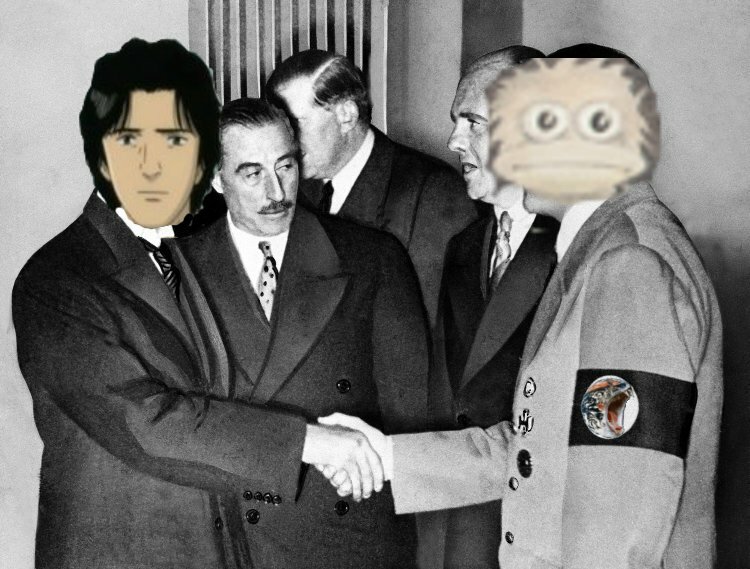 We at State News are confident that these efforts will result in an unprecedented period of good will and peace, thanks to the efforts of Admin Eldo. 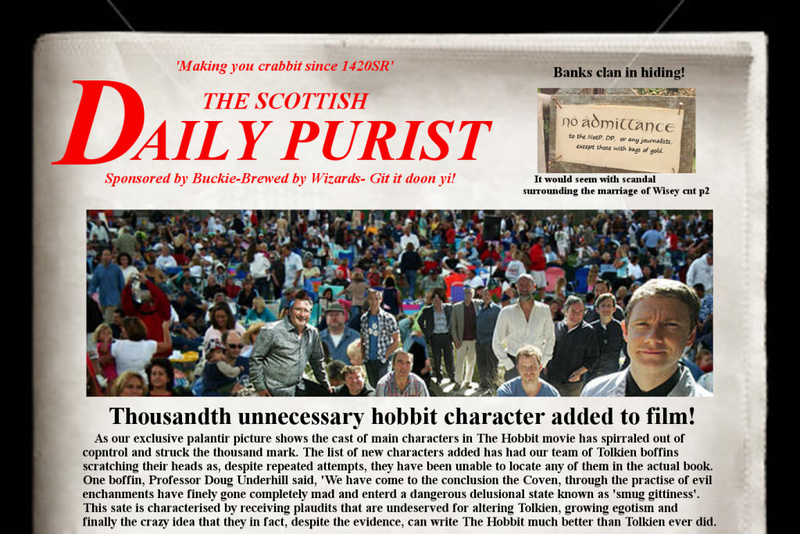 Inevitably, like all good efforts by the Administration, this news has been met with dismay by residents of Scotshobbiton. 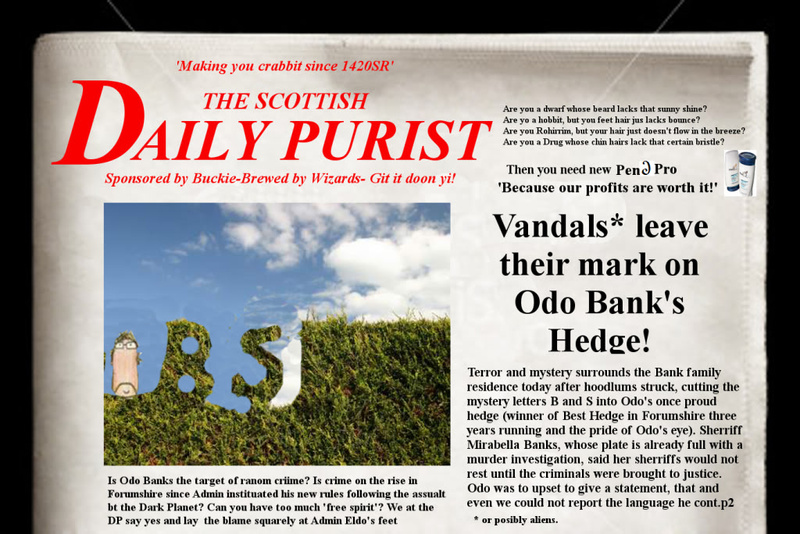 Having been roused from their buckie-induced stupor long enough to scream unprintable profanities our State News correspondent, the Scotshobbits made it clear that they were wholly uninterested in peace or cooperation with the Dark Planet. While some apprehensiveness is understandable given the difficult history and the recent destruction of the Old Forum, such warmongering must not be tolerated in a civilized society. Unfortunately, our correspondent was unable to provide any further reporting because he was tarred, feathered, and left by the side of the road by an angry mob who blamed the Administration for buckie shortages. Well this is all very well and you may consider this 'Peace in our time' malarky to be important Admin but you can't fool me, I can see the real news buried here- THERE'S A BUCKIE SHORTAGE IN SCOTSHOBBITON!!! AWAKE! Fear! Fire! Foes! For sure...I smell something fishy...you were already shaking hands "during negotiations"?? Ah, this is just like Hitler and the Pope all over again...I think. My history on that is a somewhat sketchy. Really? I'd never have known! It was British PM Neville Chamberlain who cut a deal with Germany (the Munich Agreement) he arrived back waving the signed treaty at the press and declaring "Peace in our time". The following day Germany invavded the Sudetenland. Within a year it was WW2. Well I know a little about that, and how he thought that he had sorted out the whole problem of Germany. Then Germany started pushing pressure on Poland, and NC said "if you invade Poland we will declare war on you" and they did and they did! Germany had been preparing for the second world war for years (increased passenger plane production- easy to be converted to fighters) in hindsight he does seem slightly naive! Actual knowledge! People knowing stuff! History! And on the Daily Purist thread too. Who would have thought! 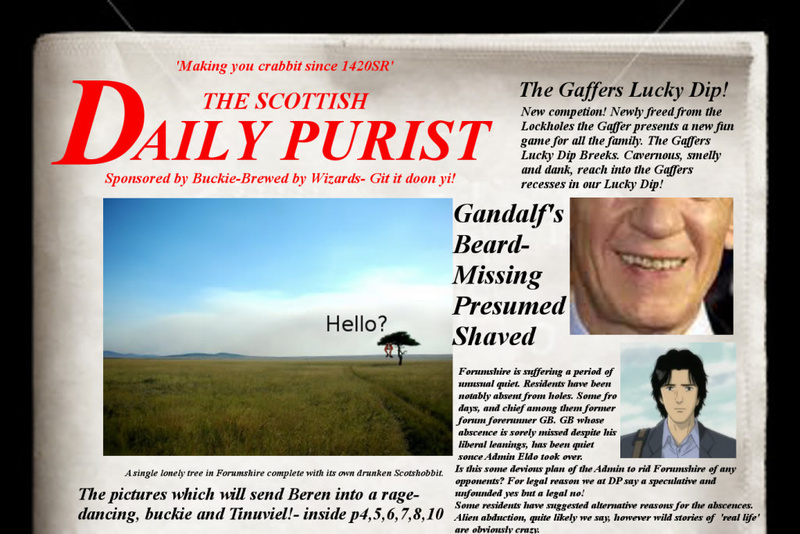 No offence intended, Petty, but I think our Eldo's State News beats your Purist on points (only just wins though, mind! ) He did go a bit soft at the end (he is always polite, I guess, and no doubt Odo will call him "Nev"), but the rest of it was hilarious! Ahh but you fail to take into account Orwell that the DP sets the news agenda- mark of a powerful paper that is. Forcing the Admin out into the public to make statements. Mmm.. sets agendas hey... wonder what Odo might say to that? He'd probably be too modest to suggest it himself --- actually, no he wouldn't! Must be asleep or something! Ally wrote: For sure...I smell something fishy...you were already shaking hands "during negotiations"?? Ah, this is just like Hitler and the Pope all over again...I think. My history on that is a somewhat sketchy. Nothing fishy here except for the fine caviar dinners shared between the Admins of Forumshire and the Dark Planet. Pettytyrant101 wrote: Ahh but you fail to take into account Orwell that the DP sets the news agenda- mark of a powerful paper that is. Forcing the Admin out into the public to make statements. What has Forumshire come to these days? Is rabble-rousing and yellow journalism a point of pride now, just because it has gone so far that the Administration must respond?